The last time I checked, we had seven graphic designers doing the output of files to our large format printers. That means we have a lot of artistic talent around the building! 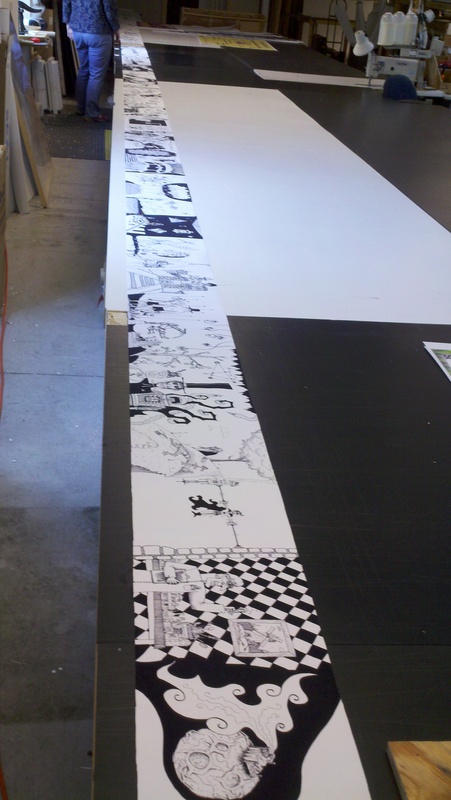 The latest example of that is the work of Mike Piper, who did a fantastic 60 foot long drawing on a roll of paper we had as an end cut. It took him four years! Good thing we had a sewing table he could put it on, and even then you could only see half of it at a time. It’s absolutely beautiful! You can find Mike on Facebook as Michael Sean Piper to see more examples of his work. This entry was posted in large format printing and tagged custom wallpaper. Bookmark the permalink.